I'm sure you've noticed that I eat a lot of Pho. Hey, I really like the stuff! I remember once having it 3 times in one day! Well, it's not very hard to do in the GVRD since there is a Vietnamese restaurant every couple blocks. Take into account that some of these establishments are less expensive than some food courts and street food, it's also very accessible. 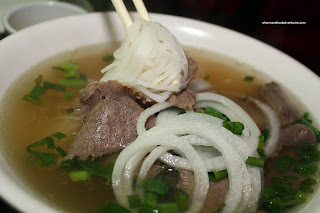 Now, Pho can easily be found in Vancouver, Burnaby, Richmond, Surrey, Coquitlam and even New West (to a degree). 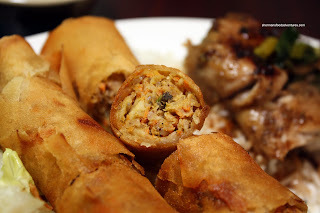 One place we do not find many Vietnamese restaurants is on the North Shore. It could be the demographics and/or it could just be the higher operational cost s. To the best of my knowledge, there are less than 5 places for Pho in North Van. Since we were on the North Shore already, we decided to hit up one of them. 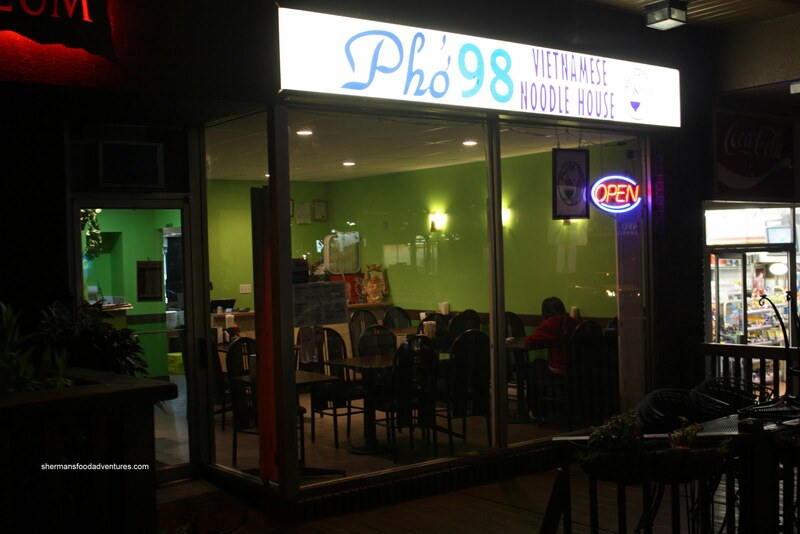 Pho 98 carries on the tradition of Vietnamese restaurants with a number in the name. We all know Pho 99, Pho 101 and the former Pho 66. Wonder if there will be a brave enough restaurant that will use the number 69? That would be some interesting spring rolls! Arriving just before closing, we quickly ordered. The owners were very friendly and did not rush us at all. Viv had the large Brisket Pho and while I was getting her to "pose" the noodles, we noticed how little food there was. In terms of the broth, it was not bad. I definitely could taste beef and there did not appear to be much salt or MSG. The broth was more savoury than sweet. The meats were slightly dry while still tender. Noodles were done right with a bit of chew left. I ended up with the Spring Roll & Lemongrass Chicken Rice. Again, for the price, there wasn't a huge amount of food. 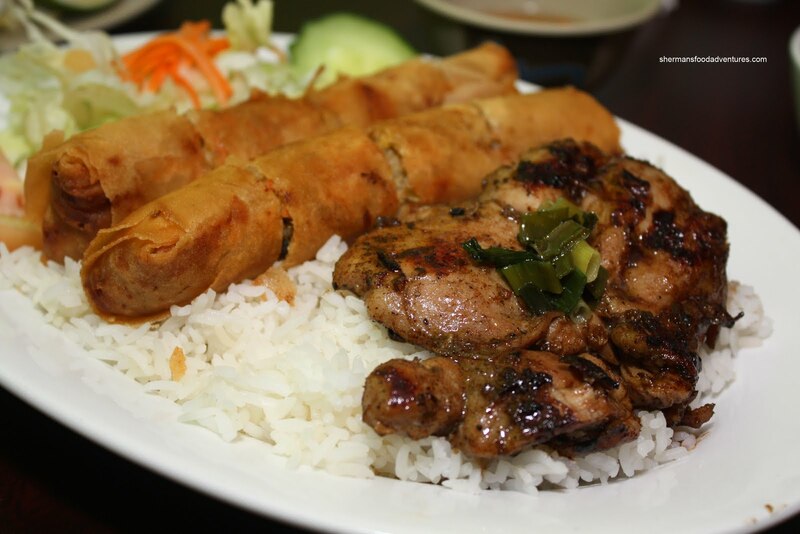 A modest piece of nicely grilled chicken was accompanied by 2 spring rolls. I didn't get a lot of lemongrass flavour; but the chicken was hardly bland. The spring rolls were okay; however, I wish more Vietnamese places would use rice wrappers. I did like the filling, it was not too loose or overstuffed. In general, the food was okay. Nothing offensive and nothing spectacular. Prices are on the higher side; but not uncommon in this area. Portion size is a bit smaller than most other Vietnamese restaurants. The owners were extremely friendly and even let us be, despite the fact we were there after closing. Nothing we'd make a special trip for; but it does the job for the locals or if you're in the area.